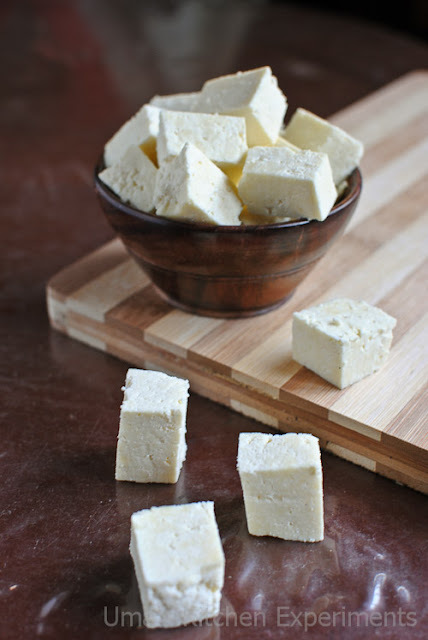 Most of the time, I use paneer purchased from store for preparing paneer based recipes. Only when I get time or if extra milk bottles/packets are available, only then I go for home made paneer. 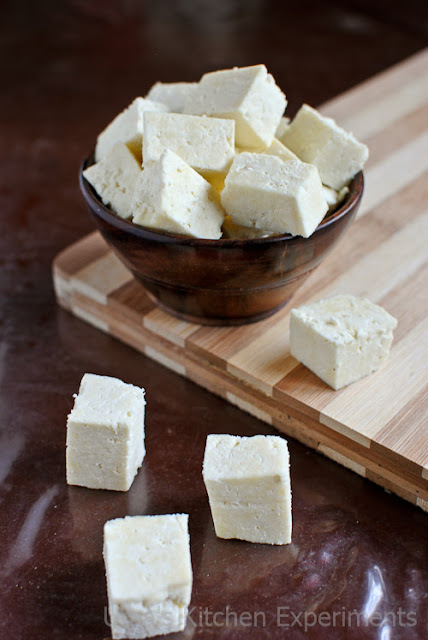 Since paneer preparation is considered too easy, until now I never thought of posting it in my blog. Later, one day, I prepared paneer butter masala using home made paneer and packed it for lunch. When I shared it with my team members, they all liked it very much. Many in my team, who are very fond of eating paneer actually are not aware as how it is prepared. 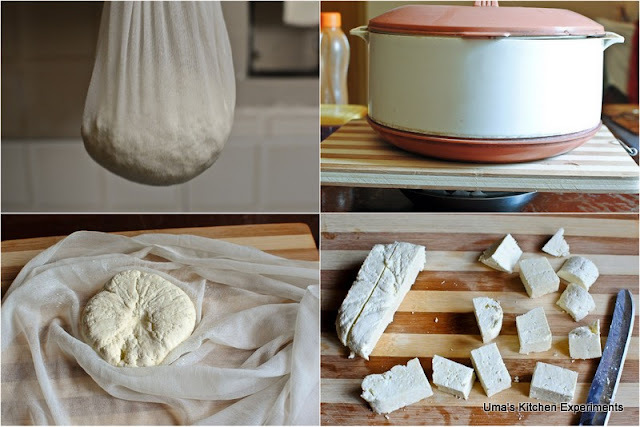 So, now I have decided to post a simple method of preparing paneer. 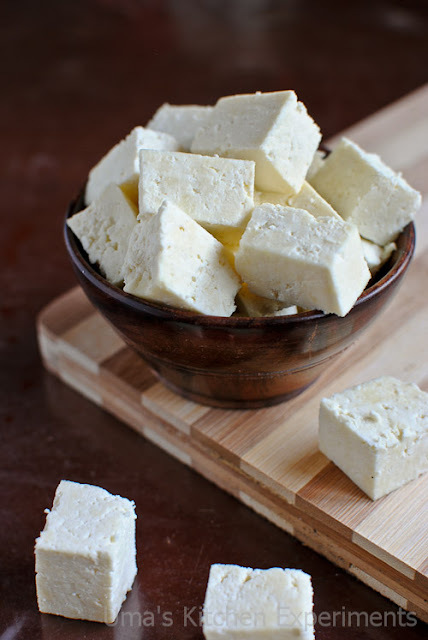 Hope this how-to helps many to prepare a low fat fresh paneer at home. 1) Take a wide pan and heat milk in it. 2) When the milk is gently boiling, reduce the flame and add the lemon juice slowly. Based on the citric taste in the lemon, you might require more or less lemon juice till the whey separates from the chenna. Make sure the milk is not vigorously boiling. At the end, you can see clear whey separated from chenna. 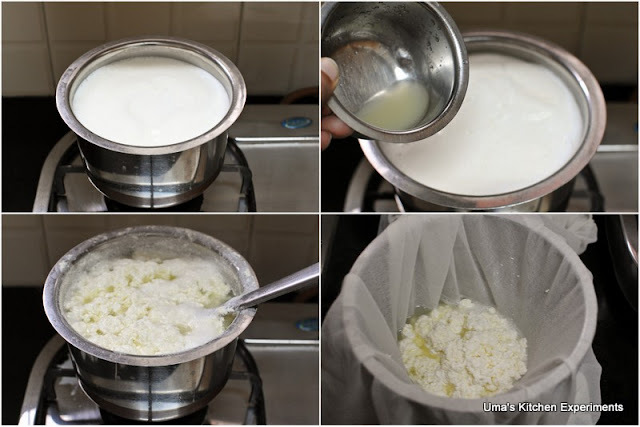 3) Using a muslin/cheese/clean white cloth, filter the whey from chenna. Make sure your cheese cloth is large enough to hang it. 4) Wash the chenna in running cold water for 2 minutes. It helps in removing the citric taste from it. Put a knot to the cheese cloth and hung in the kitchen counter or just above your sink. 5) Let it be for 30 minutes. 6) After 30 minutes, squeeze the extra water using your hand. 7) Place this in a plate/bowl and put a reasonably heavy weight on it. I used my cutting board and on top of it, I kept an empty hot pack. Make sure not to put very heavy weight on it, otherwise the paneer becomes hard. 8) Keep it aside for 2-3 hours. However this duration might vary based one the weight you used for pressing the paneer. 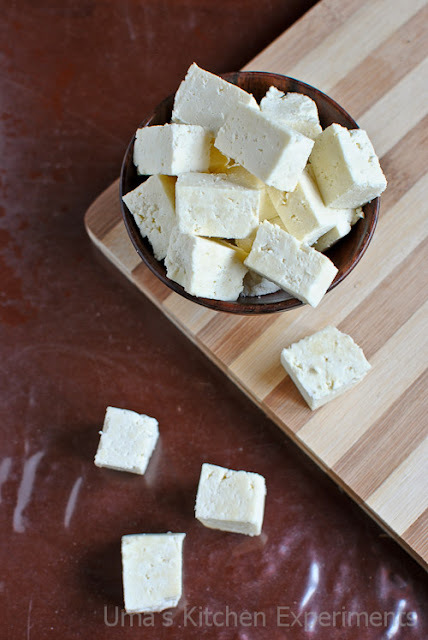 Heavier weight quickens the paneer preparation. However, one has to check the firmness at random intervals . 9) After 3 hours, cut the chenna into cubes or as per your desired shape. 10) Use immediately or store it in a zip lock bag or in a container and refrigerate it till you use it future for any gravy. 1) You can also use sour beaten curd instead of lemon juice. You might require more curd and based on it, the taste and colour of the paneer differs. I tried once using curd but it didn't suit my taste. The above method suits me best. 2) You can use the whey in making gravy if you prefer. Most of the time I discard it as I always use lemon to make paneer. 3) The amount of paneer depends upon the fat content in the milk. I got 1 and 1/4 cup of cubed paneer from the quantity of milk I used. 4) Until now, I never stored home made paneer for more than 5 days. So I am not sure about the shelf life after 5 days. Try to use within a week of preparation. 5) If you use, lemon juice from concentrate, you might require additional one or two tablespoons to curdle the milk. Click here to see the list of paneer dishes prepared by me. Nice informative post !! perfectly made paneer !! This method is so clearly outlined one cannot go wrong making it. I've never made it before but will try it. When I was a little kid my dad took a quart of milk that had spoiled and poured into a cheesecloth-lined bowl. He made a cottage cheese like the kind you see in stores. Thank you for this post and Happy New Year. I did not understand your number 7 instruction as to your placing a cutting board and a heat pad????? Can you explain or give another example because your picture shows a pot on top of a bowl? I'm confused? everytime i prepare the same when i want paneer recipe in home. I've never thought of making this on my own--so often, I buy milk at the store but completely forget about the cheese until I'm at a recipe and panic because I haven't got it. This will be perfect for making just the amount I need--thank you so much for sharing this! very good post. nice clicks and nice presentation. Very useful post dear. You made paneer very perfectly. @Anonymous, You need to keep some weight on top of the curdled milk. As I didn't have such heavy weight, I used both my cutting board and Hot pack as weight to press the paneer. Hope I answered your question. Love the white chunks of paneer!! Such a great feeling to make homemade stuff!! can i use this cheese for pizza? @Anonymous, you can use it for pizza but not as a substitute for pizza cheese.